It looks like the best days of quantitative "factor investing" could be behind us. The method of picking equities based on characteristics like quality and value has been falling short often enough for Neuberger Berman to be the latest to close a fund based on the strategy. Columbia Threadneedle also closed a fund based on factor investing in December, according to Bloomberg. These two funds oversaw a relatively modest $100 million and $40 million at their AUM peaks. Neuberger said they were closing due to the fund's now small size and Threadneedle offered similar reasoning. Other funds using the same strategy, like The Man Numeric Market Neutral Alternative Fund for UCITS, have been bleeding AUM. That fund has been reduced to $20 million from around $300 million in mid 2018. Assets in the AQR Equity Market Neutral Fund have fallen about 50% as well. One of the most popular factors used to choose stocks, momentum, has had a miserable start to 2019. Those that have been using value as a parameter have seen similar results. The results seem to confirm this. 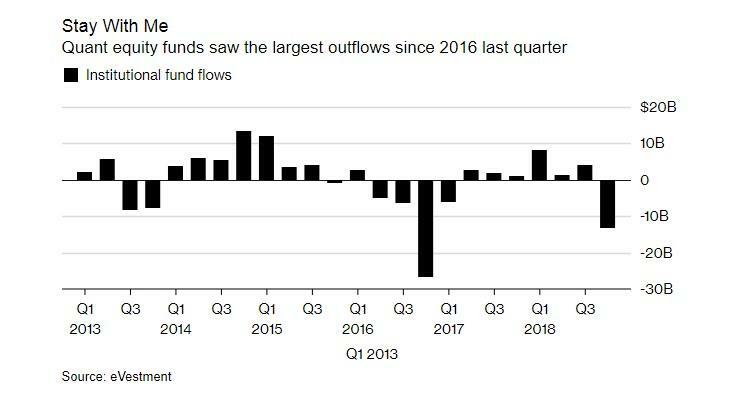 The AQR Equity Market Neutral Fund is on its sixth down quarter in a row, extending its 12% decline in 2018. The Vanguard Market Neutral Fund is down 4% this year and the Merian Global Equity Absolute Return Fund is down 3%. Troublingly, a research paper in February called “Alice’s Adventures in Factorland” pointed out that no one factor has provided statistically significant returns since 2003. But these awful results haven't stopped defenders of "factor investing" from weighing in with their best sounding academic-style excuses. 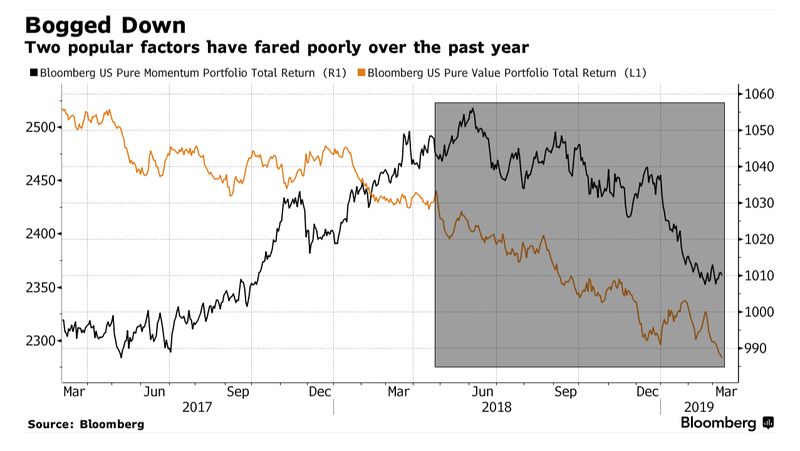 “I don’t think institutions have given up on quant investing or factor investing, but now we have some question marks,” Tayfun Icten, an analyst at Morningstar in Chicago, told Bloomberg. Sounding like an old man betting on the ponies at the horse track, Georg Elsaesser, a quantitative fund manager at Invesco Asset Management in Frankfurt said: "Depending how adaptive your momentum factor is, it may take a while for momentum performance to be reflected again." So there you have it: the way to win in quant investing is not to worry about relative performance and expect "many periods" of underperformance. We can almost determine why the "talent" in this space is having difficulty retaining assets to manage.